Everyone knows about effects of smoking, there are also so many public service ads that gives advice to quit smoking. But for smokers, they sometimes assume, breathing disorders is a reference of the effects of smoking. So if they do not cough and shortness of breath, they still continue to smoke. Though the side effects of smoking not only affects the respiratory tract. It seems they have to "give up" before quitting. Actually, the war against cigarettes has been done by many people individually as well as institutional and organizational. And on each of May 31 whole world celebrates or the World No Tobacco Day campaign. 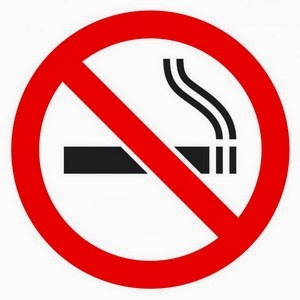 Keep in mind, that the World No Tobacco Day is a member of the World Health Organization-WHO. So, we can be sure the dangers of smoking is indeed true and not a joke. Well, before we talk about the effects of smoking, let's see the reasons why smoking is harmful to health. The point is, let's look at cigarettes harmful substances that cause health problems in each cigarette puff. Nicotine. This substance containing opium could lead to addiction, the effects on the human body: lead to addiction / dependence, damage the brain tissue, cause rapid blood clot, harden artery walls. Tar. The manufacture of asphalt that can be attached to the lungs and can cause irritation and even cancer, the effect on the human body: kill cells in the bloodstream, increasing the production of mucus in the lungs and lead to lung cancer. Carbon monoxide. Gas that can cause heart disease because it can bind oxygen gas in the body, the effect on the human body: bind hemoglobin (making the body lacks oxygen), blocking transport in the blood. Skin Cancer. Smoking does not cause melonoma, but smoking can lead to increased likelihood of dying from the disease. It alleged that, smokers at risk of developing cutaneous squamus cancer cell, a type of cancer that leave patches on the skin. Heart disease. One in every three deaths in the world due to cardiovascular disease. Tobacco use is one of the biggest risk factors for this disease. Smoking causes more rapid heart rate, increase the risk of hypertension and clogged arteries and eventually lead to heart attack or stroke. Cancer. Cigarette smoke contains 40 kinds of carcinogenic substances. The possibility of lung cancer in smokers 22 times greater; tongue, mouth, salivary glands, pharynx and 6-7 times greater, esophageal cancer 12 times greater, esophagus 8-10 times greater (WHO, 2002). Gastric ulcer. Tobacco consumption, lowered resistance to the bacteria that cause stomach ulcers, also minimizes the ability of the stomach to neutralize stomach acid after eating so it will undermine the stomach wall. Gastric ulcers in smokers is more difficult to cure. Uterine cancer. Smoking can increase the risk of cervical and uterine cancer. This cancer can be caused by nicotine in the blood. Because cigarette smoke that enters the body will soon spread to the entire body. Substance nicotine in cigarette smoke will trigger abnormal cell growth which later became the source of the advent of cervical cancer cells. Psoriasis. Development of psoriasis / noncotageous inflammation of the skin that leaves a watery and itchy red patches 2-3 times more common in smokers. Beurger disease. Disease that also known as throaboanginosis obliterans is inflammation in the arteries veins and nerves that lead to inhibition of the main leg blood flow and if left untreated will lead to gangrene (death of cells) so patients need to be amputated. Disklori on fingers. Tar contained in tobacco smoke accumulates on the fingers and nails that yellow and brown leaves. Hair loss. Smoking weakens the immune system, making the body more vulnerable to diseases such as lupus erythematosus causes hair loss, mouth sores, and eruption cutan (red spots) on the face, scalp and hands. Hearing loss. Because tobacco cause deposition on the walls of blood vessels thereby inhibiting the rate of blood flow to the inner ear. Smokers could lose early than people that do not smoke or easier losing on hearing loss due to infection. Osteoporosis. There is carbon monoxide, which is toxic chemicals that lot of found in car exhaust and cigarette smoke is more easily tied in the blood of oxygen, so the ability of air to remove oxygen down 15% in smokers, as a result of people that smoke lose bone density become more brittle / cracking and healing 80% longer. Caries. Smoking affects the chemical balance in the mouth, forming plaque excessive, make teeth become yellow, and occur caries. Emphysema. Emphysema is dilation and destruction of air sacs in the lungs that reduce lung capacity to inhale CO2 and release oxygen. Skin wrinkles. Smoking can cause premature aging of the skin due to damage to proteins that are useful for maintaining skin elasticity, erosion of vitamin A, and inhibition of blood flow. Smokers skin becomes dry and wrinkled lip and eye area especially. Cataracts. Smoking is believed to worsen the condition of the eyes. Cataracts, namely bleaching eyepiece that blocks the entry of light that can cause rates of blindness, 40% occur in smokers. Smoking can cause cataracts by irritating the eye with the release of chemicals in the lungs by the bloodstream kemata brought up.